Once again an absolutely interesting post. The use of L1 has been a matter of discussion for many years. While contradictory bibliography still endures, I believe the right use of L1 from the teacher does nothing but contribute to students’ learning process. Using L1 as a shortcut when teaching prevents frustration in the student, it also speeds up the pace of the lesson and helps to clearly understand complex idiomatic expressions when you are teaching advanced courses. Though I believe L1 use should be as limited as possible in advanced courses, using it in beginner and elementary ones should be part of the job. As we say here, it’s important to use it in the sandwich style, meaning embedding the L1 use in L2 (L2-L1-L2). By doing this, students last acoustic exposure if the L2 one. As for thinking in the L2, I still have my concerns about that. Thought cannot differ from L1 to L2. I mean we all have the ability to think. Language does simply increases and enhances such ability. What we might think is how the structure of the L2 works. Thereof, I agree with you that this “thinking in the L2” could better apply to advanced students rather than beginner ones. A great pleasure reading you, as usual. Thanks for the comment, Nicolás. As for ‘thinking in English’ – you are right that cognition, in the most is ‘pure’ sense, is language independent. So, when we talk about ‘thinking in English’ (or any other language, for that matter) we are really referring to the phenomenon called ‘private speech’, that is, the language we talk to ourselves in, which may be totally internalized, or it may be externalized in the form of sub-vocalizations (muttering, whispering, etc). It is most noticeable in activities like counting, but may surface in the form of exclamations, interjections, oaths, discourse markers, and so on, even when speaking an L2. It is a central claim of sociocultural learning theory that we use this self-directed speech to regulate the performing and learning of tasks, including speaking a second language, such that ‘our thinking processes are fundamentally carried out through the support (i.e. mediation) provided by our first language’ (Lantolf & Thorne 2006: 110). Taken together, this growing body of research suggests that use of the learners’ own language (by both learners and teachers) should not be seen only as a practical shortcut, as a crutch to fall back on, an essential tool in the development of intercultural competence or as an effective form of cross-linguistic consciousness-raising … although it is those things as well! I know some CELTA courses insist that trainees should have, at some point, experienced learning another language, in order to better equip them for the job, and this I feel is fair enough. But as for encouraging teachers to actually be able to speak their students’ language..? What about those of us who teach many different nationalities on a weekly basis… a bit of a headache, no? Over the years, I have found that, with lower level learners..
…Mean that, in my current context, I can rub along quite nicely, I feel. Thanks, Noam – yes, the multlingual classroom does pose a challenge to teachers who wish to engage the learners’ L1 in the learning process – but it is not impossible. Philip Kerr, in his (award-winning!) new book, Translation and own-language activities (Cambridge) addresses this very issue, and suggests activities that teachers can use that involve, and hence legitimate, the learners’ different L1s. Bear in mind, though, that the vast majority of language classrooms in the world are not multilingual (in the sense we are using it here, i.e. mixed nationalities learning in an English-speaking context, such as London or Sydney). It does seems somewhat misguided, therefore, that the dominant training models (such as CELTA) seem to be based on the assumption that the ‘London’ context is the default one. With great satisfaction I see that the profession will at long last come round to accepting the view of the supporting role of the mother tongue. In their state-of-the-article G. Hall & G. Cook come to the conclusion: “The way is open for a major paradigm shift in language teaching and learning” (“Own language use in language teaching and learning” Language Teaching, 45/2012, pp 271-308). In 2003 I published “We only learn language once. The role of the mother tongue in FL classrooms: death of a dogma.” Language Learning Journal (2003), No 28, pp. 29-39. In The Bilingual Reform: A Paradigm Shift in Foreign Language Teaching (2009) John A.W. Caldwell and I undertook to resolve the long-standing debate over the role of the mother tongue. “In an act of theoretical house-cleaning, the MT taboo, which has been, without justification of any substance, the perceived didactical correctness for so many years and in so many countries, will be swept away” (Foreword). For decades pupils have suffered both fom teachers with a shaky command of the target language as well as from teachers unable to give mother tongue explanations. ‘The influence of the mother-tongue must always be strong and the language teacher, recognizing this, should search for ways to make this influence help, and not hinder, the learning of a foreign language’ (Chapman, L.R.H. 1958. Teaching English to Beginners. London: Longmans, Green and Co. p. 39). thank you for the Chapman (1958) quote that I didn’t know. Every mainstream has its dissenters, every church has its heretics. For instance Michael West, an influential figure who taught in India, wrote in 1962: “One cannot but suspect that this theory of rigid avoidance of the mother tongue may be in part motivated by the fact that the teacher of English does perhaps not know the learner’s mother tongue.” Nevertheless it was Dodson who really undermined the direct method concept in his full frontal attack on the ban on the mother tongue. And at the time he was the only one who propagated new teaching techniques supported by his own teaching experiments in Welsh schools. To my mind it is not a coincidence that the most vigorous and outspoken attack against monolingualism came from someone who was himself a natural bilingual, son of a German mother and an English father. Developing bilinguals quite naturally employ both bilingual and monolingual strategies to successfully extend their linguistic competence. Yes, I do agree with Karima that your “not entirely frivolous proposal” was “bloody daring”. You certainly set a ball rolling. Thank you for adding to the growing pressure to value and encourage the use of L1 knowledge as a powerful explanatory tool in foreign language teaching. I think the vast majority of language teaching takes place outside the countries where the languages are the “national language”, and most language teachers are not native speakers of the language, so this view of the L1 as a resource is both realistic and democratic. As a British EFL teacher working abroad, I have never been comfortable with the prevailing linguistic or cultural imperialism that grants greater prestige to native speakers. Btw, Scott, when you persuade the Cambridge English Teaching Framework people to add your L1 criteria, I think pragmatics could be added to lexis, etc. : I’ve found that using L1 equivalents clearly demonstrates the pitfalls of using excessively informal, respectful or off-hand (etc.) language in a way that explanation and exemplification cannot. Good point about pragmatics, Gordon. I prepared that rubric in some haste, so any suggestions and criticisms are very welcome. 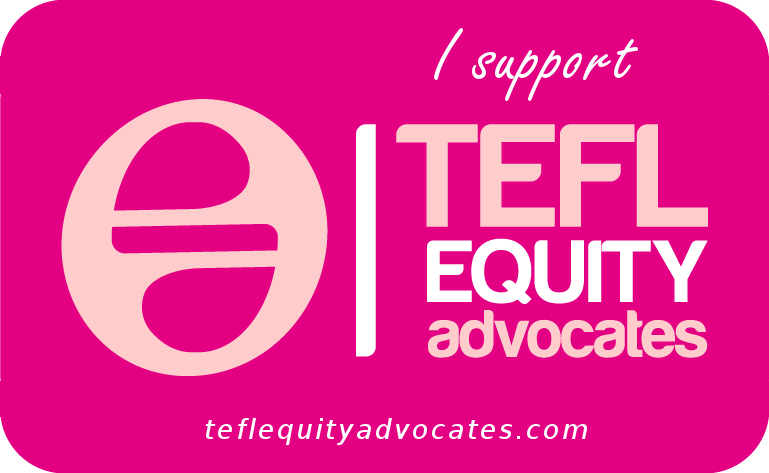 Who knows – maybe we can persuade the CET Framework ‘people’ to take it on board! Thanks, Gordon – and your comment ‘arrived’ while I was making a similar point to Noam, above, that the bilingual situation (with the bilingual teacher) is the norm, not the exception. Hi Scott, how refreshing it is to hear this from someone who I hope is more likely to be heard than the likes of many of us ‘invisible’ and ‘unheard’ representatives of our profession. What you’re saying echoes what’s been happening for many years here in Saudi Arabia (and no doubt in many other countries around the world). Over ten years ago, I worked for an American school in Jeddah which hired only locals (ie NNTs) for its A1 students. At the time, and in my ignorance, I remember having serious doubts about the service manager, who incidentally was American, until I was once asked to teach the A1 class for a term. That, needless to say, made me reconsider my erroneous view very quickly. Then I worked for an Arab school and the same practice was in place there. I learned to respect those who could take advantage of the country’s L1 in the classroom, as I also realised that they tended to have better relationships with the students. Finally, I began to master the language myself, and started using it strategically in my lessons. Understanding how the language works is important to Arab speakers who spend a lot of time learning to dissect and analyse sentences with an emphasis on metalanguage in a science called اعراب /ɪ3rɑːb/. I wish someone had told me about that before! Being French, it could have helped. Now, post Delta and in the midst of studying for an MA, I’m so glad I’m teaching at a time when technology is allowing academics and teachers to reflect in real time what’s really happening in the classroom. As much as the wealth of literature available serves as invaluable research, it can be most confusing for the teacher whose gut feeling is that something’s right, to find that all the evidence contradicts that. Thanks for being that voice. Thanks, Hada, for your comment, and for recounting your shifts in thinking on this issue. The quality of a good teacher is to be able to reassess taken-for-granted orthodoxies in the light of their own experience and intuitions. Very interesting post, as usual, Scott! It seems to me that researchers tend to forget that the number of young learners is increasing, and that whatever new method they come up with needs to be tailored to their needs. I’ve learnt about some “immersive methods” in which teachers speak only English to babies and toddlers. They are becoming quite popular here in Argentina, but I’m not quite sure if they actually work, or if they are just designed as money-making machines. Have you heard about that? I learned English with a total immersion method and it worked wonders. Many of my friends also learned with the same method and all of us are if not 100% bilingual, well, almost. My children also learned by total immersion and they speak both languages proficiently. Hi Julia, yes, there is a lot to be said for immersion, as the experience in immersion schools in Canada has showed, and as many immigrant children, who have no choice in the matter, demonstrate (although their experience is perhaps better characterized as submersion). Likewise, the move to introduce content-and-language-integrated-learning (CLIL) in many European contexts assumes that there are benefits in a monolingual methodology. Nevertheless, even proponents of immersion agree that (a) the teacher needs to know how to support the learning experience of the learner by, crucially, ensuring that the input is comprehensible – for which on the spot translation would seem to be a highly useful skill and (b) that the child’s first language is adequately supported – which, in contexts where language planning is driven by a nationalist ideological agenda, as in Catalonia – is not always the case: see M is for Monolingualism. Thank you again and I will definitely read M is for Monolingualism. I find your comment quite interesting. Last week, at the IATEFL conference in Manchester, Michael Carrier talked about the importance of multilingualism and the respect for the students’ L1 in the classroom. He argued that research has shown that a good command of the mother tongue is crucial in order for successful second language learning to take place, which is why it might be more beneficial for students to devote more time on mastering their L1 during their first years in education. In other words, a thorough knowledge of the first language would increase second language competence. Thus learners need to be ready for second language learning, and when that moment comes, it is my opinion that their mother tongue could provide the necessary bridge towards that new world of languages. “….it might be more beneficial for students to devote more time on mastering their L1 during their first years in education” – indeed – and see my comment to Julia above. As Siegel (2003: 196) in summarizing the research on immersion schooling, points out: ‘L2 immersion programs are effective for learners from dominant, majority language groups, whose L1 is valued and supported at home and by society in general. However, transitional or continuing bilingual programs are more effective for subordinate, minority language groups, whose L1 is seen to be of little value and receives minimal support’. Siegel, J. (2003) ‘Social context’ in Doughty, C.J. & Long, M.H. (eds) The Handbook of Second Language Acquisition. Oxford: Blackwell. Hi Sol – yes, and another reason the teacher of young learners needs to be able to speak his/her students’ L1 is to be able to talk to their parents – without which an important channel of communication is effectively unavailable. In fact, I would venture to say there is no such thing as “language” at all, as we conventionally understand it, as in separate languages ie. the language of English being separate from the language of Spanish. This is a construct we use to simplify reality and something of a layman’s term, which leads us to act as if languages existed in inherently and hermetically sealed units which we could then analyse. That is a myth. Indeed, Jonathan – and now neuro-imaging is telling us what some sociolinguists have been claiming for some time, i.e. that language is an uncountable noun. I’ve blogged about that here: L is for Language. A very interesting debate, and a thought-provoking post Scott. the mother tongue is a difficult number in the language classroom. Teachers are torn between a total and pure use of the target language, which maybe interrupted then and now by the students’ use of the mother tongue through language transfer or inter-language, and the teacher is consequently forced to respond to the learners. Now the use of the mother tongue as a means of instruction through translation can be dependent on the teacher’s knowledge degree of the learners’ mother tongue and the target language as well. Agreed, Manaraboba, and an assessment scheme for teachers that does not factor in L1 knowledge is an incomplete one, I would argue. Thank you Scott for such an interesting article. I have never ventured in commenting on your articles because I have always been very self-conscious of my English writing. I read what you write and the majority of comments and everyone writes very well. I hope then that I don`t make a fool of myself by writing at a much lower level than everyone else. I am a Mexican teacher and have been teaching for more than thirty-four years. Out of those thirty-four years, eleven years have been dedicated to teaching ESL, the rest, I taught content classes in English. I am proficient in both English and Spanish languages so I fall in the category where I can use students` L1 in my classes(expert in your rubric). I do use both languages, especially if the level I`m teaching is basic or pre-intermediate. I have seen that there is a very fine line when teaching ESL and using L1. Students come to expect that you explain what they don`t understand in L2 in L1. They rely on the L1 explanation and sometimes do not make an effort to use the language they are learning. I have had students in high-intermediate complain because I do not say the instructions in Spanish. I have students in advanced level that are not able to use the L2 fluently and keep going back and forth between both languages. So, my question is, how much L1 should a teacher use? I do feel that using both languages in the lower levels is necessary, but the how much and how often would have to be addressed when training teachers. As a bilingual speaker I must say that language is automatic, I do not think in English or Spanish, unless, like you said, when I`m talking to myself. So, that is one aspect I do not address in my classes because it can not be taught. Thank you once again for such interesting articles and for all the comments that these articles provoke. Hi Julia: for your question (‘How much L1 should a teacher use?’) there is no single answer, just as there is no single answer to other key methodological questions, such as ‘How much grammar terminology should I use?’ or, indeed, ‘How much explicit teaching of grammar should I do?’ As you suggest, the age and proficiency of the learners will be an important factor, but, as a rule of thumb, I would say that the younger and the less proficient, the more there is a case for a bilungual pedagogy. As the learners become more confident in the L2, the L1 support can be withdrawn. Thank you Scott for your post. As the DOS of a fairly large language school I require teachers have a good working knowledge of the L1 in order to be hired. I started my career 20 years ago at Berlitz and really identified with the students who were begging for a simple translation or explanation of a grammar point in the L1, which we were not allowed to give. Isn’t Total Immersion passé? Maybe that is why Berlitz are so obviously absent from conferences such as IATEFL. Hi Jane – I’m pleased to hear that you prioritize L1 knowledge in your hiring progam. Whether or not total immersion is passé, it still seems to underpin teacher training programs, as well as being the assumed model for coursebook production. When did you last see a coursebook that adopted grammar-translation principles?! Thank you for this insightful and interesting article, Scott. I had my Eureka moment when I read Butzkamm’s work and it wasn’t just an insight. It set the fundament of my future by allowing me to serve all those who suffer from the predominant system of solely using the L2 in the classroom. Thank you for that once again, Wolfgang, even if there were others before you, you made the difference. I have a rather practical contribution to this discussion: When teaching a language in a country of its origin to adults, it is a mere economical consideration if not necessity for language schools to stick to L2. This way they can put much more students into one classroom, independently of their L1, and also have more teachers to choose from, independently of their L2. When taught abroad with non-native (L2) teachers that point doesn’t really apply. But, I worked for Berlitz Poland in my early years and they had me truly convinced with a ten minute presentation of their method, which by the way they most likely still use as their sales pitch nowadays. This approach was and still is different from was being taught in regular schools. Also native speakers seem the most competent in their native language than any other teacher in a foreign language, no matter how well they have mastered it. They also have something exotic to them, are samples of the people one is going to get to know with help of this new language. It all makes so much sense, even nowadays. But mainly from a marketing perspective. 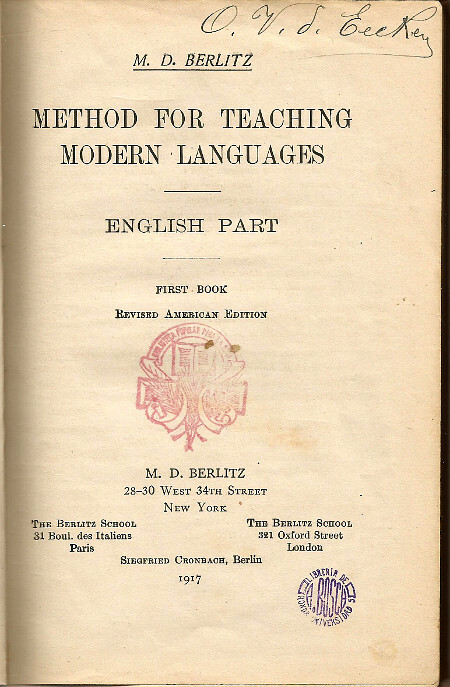 I don’t want to suggest that the old Berlitz was a clever businessman as I haven’t read much of his work but the actual Berlitz company – as well as any other language school operating this way – certainly benefits from teaching solely in the target language. And Gordon, you made me realize that using only the L2 in the classroom is like a dictatorship: Everyone is forced to use a language that he or she does not understand and feels insecure in and there is only one person who has mastered it and rules the class: the teacher. One last point: I went through a horrible French instruction for four years in a time of my life in which I could have learned it swiftly and properly. The problem was that there was not much French being used in the classroom, nor any visible didactics from where I’m standing today. Which is the other extreme, that I know you are all aware of. My point is or better my initial question when I read this article and its discussion was, aren’t we preaching to the choir here? I haven’t read any opposing statement until now. How do we reach those, who are “spoiled” by the system and are possibly not actively doing any more research other than finding new games and text books? Choir or not, I’m very glad I found your blog by a hint of a friend, Scott, and will read my way through it in the coming weeks. Thank you, Michael – and I hope Wolfgang registered your ‘eureka moment’! Yes, I think the Berlitz Method was partly driven by commercial considerations, and, indeed, Berlitz himself seems to have been an extremely astute businessman. Having founded his first school (in Rhode Island) in 1878, ‘by the time of the start of World War I in 1914, there were over 200 Berlitz Schools worldwide’ (Wikidpedia). Direct method teaching required nothing more of the teacher than a talent for mime and drilling, and hence obviated the need for exhaustive training. And, in theory at least, a Berlitz teacher in France, so long as he or she was a native speaker, could be equally as effective should he move to Germany or Istanbul. The formula of minimal training, mobility, and monolingualism was one that the International House schools perpetuated in the 1960s when they designed the ‘four week course’, which morphed into today’s CELTA. First off, thank you very much for quoting from the message I sent you a couple of days ago –really appreciate it. What a truly fascinating and provocative blog post and comments! I cannot agree with you more or put it better than you did when you say ‘ learners are probably not learning English to join a single monolithic discourse community … hence there should be a pedagogical focus on practices in which the learners’ mother tongue is not proscribed but legitimized.’ I also second Gordon Dobie’s idea that the vast majority of English teaching takes place in countries where English is not the mother tongue – In my country (Algeria), for instance, English is an L4! We have Berber as the national language, Arabic as the official language, French (widely used because of the colonial past of Algeria) as a foreign language then English. Although, in my opinion, the use of L1 in a language classroom should be limited, I strongly believe that the teacher’s knowledge of the students’ L1 is an invaluable tool that helps him or her get inside the mind of the students, understand better the nature of their mistakes, for example when caused by the interference of L1 or other shared language(s). Plus, sharing the same culture, I believe, helps tremendously in understanding the students’ way of thinking, writing, and expressing themselves. Let’s hope your proposal at IATEFL conference and this very interesting debate triggered by this blog post won’t fall on deaf ears and get put indefinitely on the back burner. Thank you, Karima – and thank you for allowing me to quote your supportive message. It’s been too long that the voices of multilingual, non-native speaker teachers in the periphery have been drowned out in the din generated by the inner circle ‘elite’. I found this very interesting as I often ask my students how they use their L1 to learn, for instance, English spellings. Their answers have been quite a revelation and help me plan ways of learning that they are already comfortable with. Thanks – and, yes, asking students about their learning strategies can throw useful light on how the L1 can be an aid for learning, not a hindrance. I have studied ten languages and most definitely make use of my other languages in my classroom when that knowledge can expedite any aspect of the lesson for any learner. While I struggle to prevent my morning class from becoming one big Mandarin-language social hour, I never bat an eye at L1 use in my afternoon ESL literacy class. In fact I encourage my students to teach me their mother tongues as we go along, and I often give instructions first in English and then in the learners’ languages–to the best of my ability. It’s nice to know there’s a bit of research out there to validate L1 use in the classroom, something that is intuitively “okay” in my book. Thanks for the comment, Kelly. It’s all about finding the right balance, as your account of your two different classes suggests. Scott, I agree with you that banning the use of the students’ L1 is deleterious, but what you’re suggesting is a little scary if one is an ESL teacher, one’s second language is German, and one is teaching in the U.S. to multilingual classes with mostly Spanish-speaking and Asian students. There’s a bit of a work-around if the teacher doesn’t speak the students’ L1, which seems to happen a lot in multi-lingual classes. One student grasps the idea in English and then may then explain it in, say Chinese or Spanish, to another student who doesn’t get it. I found it particularly frustrating when teaching low level English learners in India and there was no common language that any of us shared. It’s far easier with higher level classes. Students teach one another – good for everyone. Yes, the multilingual class in an ESL context does create a real challenge if you subscribe to a more tolerant attitude to mother tongue use – see my comment to Noam way up near the beginning of this thread. But in many ways the multilingual classroom reflects a multilingual world outside – for which English is often the lingua franca, but where code-switching and code-meshing are also legitimate means of communication. I work at a school in Australia, where all of our classes are adult and multilingual. And the school has a very strict ENGLISH ONLY policy. I thought I’d put that in capitals as that’s how it’s plastered all over the school. If students are caught speaking their own language (or any language that’s not English) then they must leave for the rest of the day (I can hear the gasping!) Now, I totally agree with the benefits of translation in the classroom as a learning tool mentioned above. However. do you know who’s in favour of the rule the most? Students…all 600 of them (I think we’re currently the biggest private language school in Melbourne). It’s one of the school’s biggest selling points for students. What they like about it is that they cannot fall into the easy trap of coming to Australia with all the good intentions of speaking English most of the time and practising a lot, only to meet students from their own country on their first day and suddenly realise that they spend more time speaking their L1 rather than practising what they’re paying $300 or so a week to learn. In common rooms it also makes for a more open atmosphere. You see more students mixing together rather than tables of single nationalities all talking together. Some students even hang out at school together just so that they’ll continue speaking more English, as they know once they walk out the door they slip back into their L1 or have no one at home to speak English with. It’s common for students to live in share houses with those from their own country. Is it perfect? No. Do I often want to do translation activities in class? Yes. Do I sometimes tell students to translate to their friend by writing? Of course! I think the real benefit is encouraging practice and a more communal atmosphere at the school, which then encourages more practice. Lastly, out of 40 + classes, there are only about 3 or 4 Elementary (A1/A2) level. Most students come to the school already able to communicate at a reasonable level. It is quite tough for those very low-level students but they are all made very aware of the rule before committing to pay for their courses. And even at that level, they want to be pushed to learn/practice more and they feel this is a good way. Hi Scott – and thanks for being the ‘dissenting’ voice. I would totally support the idea of the ‘English only’ intensive course in Australia, taking into account the diversity of languages in any one class, which makes English the ‘natural’ choice of lingua franca, apart from its dominance outside the classroom. And also, as you point out, given that most learners will have gone beyond the A2 ‘threshold’, i.e. they will be able to just about cope without recourse to a little bit of help from their compatriots. If it helps further your argument, I signed up for an intensive two-week course in Spanish last year, where the B2/C1 class were from diverse language backgrounds. What particularly irritated me was when the teachers broke (the unwritten but generally accepted) ‘Spanish only’ rule to translate vocabulary items into – of all languages – English, assuming (reasonably enough) that, if it wasn’t our L1, we all understood it. I remember thinking, at the time, how this conveyed all sorts of wrong messages, not least in the way it undermined a commitment on all of our parts to really work hard in order to negotiate meaning – something, at this level, we were perfectly capable of doing. Nevertheless, I do remember coming out of those four-hour classes so immersed in Spanish that it persisted in my ‘private speech’. However, as I have pointed out above: this kind of context (adult, intensive, B2+, mixed language backgrounds, native speaker teacher) is in fact the exception, not the rule, in the great scheme of things. The pedagogical approach it lends itself to is not necessarily exportable to other, majority contexts. Fascinating discussion, and maybe it’s worth looking at some more more prolific example. Middlebury College is one of the top liberal arts schools in the US. They offer intensive immersion programs over summer, and apparently have been doing so for 100 years. Every student has to make a pledge not to communicate in anything but the target language for usually 6 to 8 weeks. I got some insights from a former student of mine who used to teach German there. Apparently, for many students the stress is extreme. Dropouts and nervous breakdowns abound. However, those who make it through also make amazing progress. Thanks for that reminder, Klaus – in fact I have a colleague who studied Mandarin at Middlebury, and it was everything you describe. I’m certainly not averse to the idea of immersion, but learners need to be willing to ‘make the pledge’ and arguably be of a certain threshold level, and the teachers need to be incredibly skilful at making input comprehensible. Because it might work under these conditions doesn’t mean that it will work under all conditions. I run a school in Japan and only hire teachers who have experience teaching here much for the reason that knowing Japanese and Japanese culture can be a very big help in relating to the students and understanding their perspective, even if the teacher seldom uses it in the classroom. That being said, I find myself a little perplexed by the comments here. Maybe it’s because the vast majority of language in English classes in Japan is in L1–often as high as 80%-90%. I find it hard to imagine a situation where there is not enough L1. My perspective from where I sit is that instead students are usually held back by L1 overabundance. Thanks for the comment – and, yes, your perplexity is understandable given that current language teaching pedagogy takes it as axiomatic that classes conducted entirely or mainly in the L1 (as in the Japanese situation you describe) are unlikely to be effective. This doesn’t mean, of course, that they should be conducted entirely – or even mainly – in the L2. The balance is one that will depend on all manner of contextual factors, just as the balance between accuracy work and fluency work will also be context-dependent. Good teachers adapt to their contexts so that, ultimately, their contexts adapt to them. I am really thankful for this discussion as the use of L1 still causes many of us to feel guilty when using it in class. It is sad, however, that there is not one answer to the matter of how much we should use in our lessons or when. In general terms, it seems that the lower the level the more we can use it. Yet, I think it is not as simple as that. I have been involved in teaching for almost twenty years although I have not been actually teaching in the past two. I think that our position towards the use of L1 comes to the way we learned English. I went to a bilingual school and my first teacher spoke to me only in English when I was five years old. So for a long time I thought that was the “right” way to learn it. It was until recently that I realized that my students’ experience was completely different. None of them went to a bilingual school, many of them only had from three to five hours of English a week or even less. The only time for them to use English was in class. You may wonder how it is possible that I knew so little about my students. It was not that. It was that ‘English only’ was my creed. How many of my first-month students failed? abandoned? decided English was not for them? How many succeeded? How many learned how to ‘think in English’? As you correctly pointed out, we have to question and revise our beliefs. Whenever I attend a seminar in my city or other cities in my country, the use of L1 is out of discussion, but I am sure that there is a lot of L1 going on in class. I hope that more people will become involved in discussions as these. Thank you, Roxana – and, yes, the experience of having an immersion-style primary education is very different from the experience of older learners studying only two or three hours a week – and so the methodology needs to adjust accordingly, to take into account not only their age, but also the very reduced time available. Anything that saves time has to be a good idea. AS a foreign language teacher, I would agree that the use of the mother tongue saves time and effort, because what I explain in one hour’s time in the target language, is explained in less time if stated in the mother tongue. This goes true for subjects where terminology is including new concepts (such as neuroscience or educational technology subjects), and the teacher feels obliged to state the terms in the mother tongue for more clarity. I think, however, that the use of the mother tongue affects negatively the students’ fluency and even their way of thinking, mainly when this is part of their way of instruction. The question is, if we rely on translation as a means to integrate the mother tongue in the teaching/learning process, to what extent can we trust the appropriateness of our translations, mainly when full texts are concerned? Hi Manar, yes, I always used to argue that an explanation (e.g. of a word or a grammar structure) that was done in the target language would require more cognitive effort in the processing, and therefore would be more memorable than a translation, even if it took longer. But I know of know research that confirms this hunch. Nor can I be sure that the possible anxiety engendered by so much L2 use might in fact be counterproductive, cancelling out any learning gains. I’m not sure I understand your last point though – are you saying that translation can be unreliable? Sure it can – but so can other ways of conveying meaning (mime, visual aids, L2 definitions/explanations, etc). what I mean in the last point is that the main shortage of relying on translation from an L2 to an L1 or vice versa is the degree of success in keeping the same meaning and using the right words to get the same influence and learning outcomes. Moreover, the new words introduced in English dictionaries thanks to technology and science inventions have no equivalents in many languages, so the use of the mother tongue in such cases in sterile. Even in terms of learner use of dictionaries, I find the frequent use of monolingual dictionaries more beneficial than bilingual dictionaries, since learners enrich their linguistic repertoire through reading and understanding the target language word entries, if compared to word to word bilingual dictionary entries. Hi Manar, thanks for your clarification. I’m not underestimating the challenges of translating between one language and another, but the fact is, it’s possible, even if it requires fairly sophisticated knowledge of both languages. (If it weren’t possible, the UN would stop functioning!). That’s why I included the teaching of translation and interpretation skills in the ‘expert’ level of my revised CET Framework. Nevertheless, I think that even a B1 knowledge of the students’ L1 can suffice for translation at the level of, say, the top 2000 most frequent words in English. Hi Scott, I agree that no method is a perfection, and translation is a case in point. I find your statement “I think that even a B1 knowledge of the students’ L1 can suffice for translation at the level of, say, the top 2000 most frequent words in English” a great observation. If we consider Chomsky’s deep structure theory that is universally shared among languages, then we can translate between languages through creating appropriate word lists common between the target languages to translation, so when we intend to translate, the words picked must belong to the same word level (2000, 3000, 5000, 10000, or the Academic level, in respect to Nation’s 1990 levels). I’m a Pole and an English teacher. I have taught English in Poland and in Australia so I am familiar with the mono-cultural context as well as the multi-cultural one. I am currently working in Poland. When I teach the present perfect I usually rely on imagery to convey the function of the perfect aspect. I have developed a whole lesson which compares the present perfect to a bridge. However, when in working with a class of Poles, I also ask my students to translate two sentences ‘in their heads’: ‘I have been to London.’ and ‘I have lived here for 5 years.’ I do it because I know Polish and I know that they will use the past tense and the present tense respectively in their L1. They then notice how the present perfect works like a bridge. If – occasionally – there is a student in the group who is not Polish I ask them to do the same but I cannot ‘check’ their work in this case but I still manage to elicit a response whether there is a similar structure in their L1 or they have to use two different ones like in the case of Polish language speakers but the fact that my students actually juxtapose English structures against the structures used in their L1 helps them to ‘tame’ (the word grasp would be too much here as they need time to learn to use the structure freely and correctly) some of the more difficult concepts of English grammar (in this case). When I explain this to my colleagues who are native speakers of English, they often comment that they had never realised it because they don’t know Polish. So, I guess I have just ‘joined the choir’ but the above seems to substantiate it. Hi Matt – your posting provides a good example of how the teacher’s knowledge of the learners’ L1 can aid learning, without necessarily monopolizing the classroom language ‘ecology’. Using imagery to convey the subtleties of perfect aspect is probably far more effective than attempting an explanation in the students’ L1 (Polish in your case), but the judicious use of L1 sentences for comparison purposes can really help drive the point home. Thanks for sharing! I can cite no foot-noted, academic evidence of the advantages and effectiveness of the “Target language only” rule for foreign language learning and teaching, but my personal experience of learning Russian, a bit of Norwegian, French and German plus a professional life-time of facilitating and observing the learning of English in a number of countries has convinced me that such an approach can produce impressive results.How relevant to a learning a language is it to know from neuro-linguists where the language learned is stored? In my anecdotal experience, once learners know that the the teacher speaks their language there is an immediate lessening of productive tension, straining-to-understand. “The teacher speaks my language. Please teacher, what is that in our language?” And what can “knowledge of the learner’s language” lead to? Comparisons. What else? And comparisons can too easily lead to explanations – talking about language, translation – and how productive is that? “Never” is likely to be a bad guide is most matters pedagogical, but in the case of “English /Target language only” I have simply experienced too many groups of learners, from primary school children learning English/Polish through to adults in Bosnia, including a General, also learning English, where translation was minimal, the exception , a quick aside, and the learners got high on operating the whole time in the target language. Using a language is a performative skill, and those of you who play a musical instrument will surely agree that nothing improves your performance like playing. I would personally make no claims about training learners to think in a new language, I used to encouarge my German university students, nominally future teachers of English, to practice saying and writing what they could in English as opposed to what they might have said in German. That is a “game”, a performance that can be mastered/mistressed. Translation seems to me to imply that in a foreign language one is trying to say, to be, the same person in two languages. But so many bilnguals bear witness to the fact that they feel different in different languages. This post was very interesting and I can relate to this. I’ve noticed that learners appreciate it when problematic words or phrases are translated into their L1. Not only does it help the learners ‘connect the dots’ so to speak, it sometimes also comes with the added benefit of creating a mutual respect between the learners and the teacher. Using the L1 in class would be very useful for NNS teachers especially, as some NS teachers may make mistakes in translation. Furthermore, some NS teachers (as you have mentioned) may not be as comfortable with using L1 in class, either through lack of knowledge about it, or they may incorrectly hold the belief that using the L1 would be detrimental to the learners. I agree with your assertion that teacher effectiveness should in part assess their L1 knowledge, as this is an often overlooked asset. As you stated, it could help to reduce NNS teachers ‘guilt’ in using the L1 in class and could help to encourage NS teachers to learn the L1 of their learners (if in the correct context). Most importantly, it could help learners improve their L2 at a faster rate. Thank you for raising this thought provoking topic! Hi Scott, there has been a lot of discussion about the interactions in the classroom between teacher and learner switching between L1 and L2 but what about the interaction between student to student? I have a group of learners at intermediate level whose L1 is Mandarin and I am experimenting with the use of their L1 by sometimes encouraging them to use their L1 for a stage at the beginning of group work to generate motivation, ideas, discuss real life situations etc so that they can then work as a group in a role play acting to be a marketing team in a business. (The end result will be a production of an advertisement in English). They then spend some time translating their ideas and concepts into English using dictionaries etc and then feedback to the whole class and to me. The amount of discussion is amazing and they appear genuinely motivated to then get on with the project having gained a clear insight into the tasks for their group and new knowledge learnt. I facilitate their use of L1 for this stage but I do not know or need to know their L1. It seems to work. Perhaps the practise of facilitating the use of L1 in limited situations to create ideas, motivation etc is a valid learning tool regardless as to whether the teacher has knowledge of the group’s L1?? ” I am experimenting with the use of their L1 by sometimes encouraging them to use their L1 for a stage at the beginning of group work to generate motivation, ideas…etc” This sounds like a really sound way of exploiting their common language, and then transitioning to their L2. Thanks! Learners are individuals. Translation works for nobody is as bad as only translation works for everybody. I find a person with an interest in language learns a L2 better than one lacking interest. Awareness of the structure, sounds, idioms and jokes and songs of their L1 seems to help L2 learners appreciate the L2 and acquire chunks of language that convey meanings known in the L1 but not directly translatable. There is more going on in a classroom than learning L2. I find extra communicative ability in the L1 is often helpful and discussions in L1 can often clarify matters and can engage the interest of less enthusiastic learners. I would find that a false and inefficent approach. As always, of course, the particular circumstances and language needs of a given group of learners and their teacher should make the most appropriate approach clear. Wow, this is such an interesting and difficult topic. Thanks, Scott. I recently read your 2010 post on Grammar Translation and have been meaning to post some comments on that. 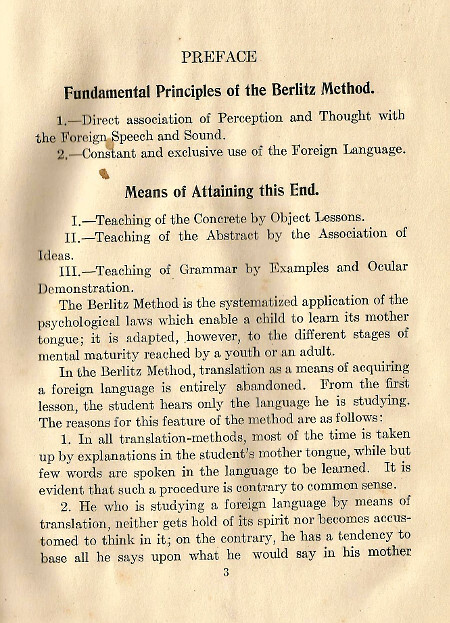 While I don’t agree with all of Berlitz’s reasons for not allowing translation in lessons, I do agree with the “spirit” of his approach. Most of my reasons for taking the target-language only approach are based on my experiences as a language learner (and working with Korean co-teachers who translated every word I said!). 1) Translation should be a tool, not an approach. Even if the teacher doesn’t help the students translate English into their L1, they’re going to do it for each other and in their own heads. Bilingual dictionaries and apps can be used outside of class. 2) Language lessons that rely on translation can easily turn into linguistics lessons about the target language with no real language learning taking place. 3) It’s too easy for students to make less than a full effort in learning the target language if they can resort to the teacher translating. 4) When not operating in an English framework, many language learning opportunities are missed, e.g. if instructions are given in the L1. 5) Language learners need to be comfortable with ambiguity and not expect to understand everything right away. 6) LLs need to learn the skill of circumlocution, both in terms of describing something and understanding someone else describing something. 7) Translation diverts from the goal or task of using the target language and can easily turn the goal into finishing the game, conversation or exercise in whichever language is more convenient. The activity is not the goal. Using the target language to do the activity is. 8) What happens to scaffolding? Translation can easily push the pace to a point beyond what the students are capable of handling in the TL. It’s easy to just dump vocabulary and grammar on students via translation, but how does that help them learn and use it? Only using the TL language during the lesson keeps the pace manageable. 9) While beginners can not have normal conversations about sports, politics, family, life, etc., they can talk about the language they are learning, i.e. the vocabulary and grammar, or listen to the teacher talk about those things and work on their listening. 10) The L1 can be talked about in English in order to compare the languages. Regarding “thinking” in the TL, Steven Pinker in “The Language Instinct” stated that, in the context of how restrictions on freedom of speech affect people’s thinking and beliefs, that thinking does not come from speech. It’s the other way around. Otherwise, how would human speech have developed? I know that I’ve had conversations with non-native speakers and then, a while later, I remembered what we talked about, but couldn’t remember if we talked in English or in their language. I appreciate the information you shared on neuroscience as that is something I had been wondering about with regard to language learning. Finally, I remember in my MA TESOL program one of my professors made a brief comment about the language learning hierarchy or ladder with regard to learning an L3, L4, etc. Her point was that if we are learning, say, an L4, our minds, when we are looking for a word, are going to go up the ladder to our L3, not our L1. I haven’t found any research on this but I have experienced this a lot in various languages. Do you know of any research on this topic, Scott? Thanks. Thanks, Jeff, for that. It’s true that – like any pedagogical intervention (e.g. drilling, correction, reading aloud…) translation can be a technique that is mis-used, even abused – in all the ways you mention. Nevertheless, it can also actually support learning – in the sense of scaffolding it – as in Community Language Learning, where translation of the learners’ intentions provides them with the raw material to have conversations. As for L3, L4 etc influence, it’s true that there are transfer effects from previously learned languages (Ln) but I doubt very much that there is a clear ‘ladder effect’, as you describe it. There are so many competing factors that cause transfer, including similarity/difference between Ln and L1; recency of using or being exposed to Ln; degree of knowledge of Ln; linguistic nature of the item being transferred (e.g. lexical, grammatical, phonological, etc): interlocutor’s Ln; and so on. 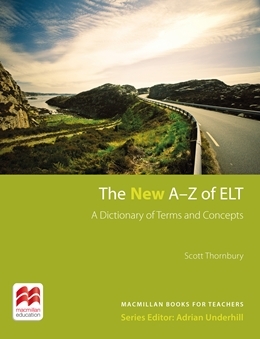 One study of learners of English who speak both Finnish and Swedish, for example, found that, ‘whereas the Finnish speakers avoided transferring elements from their L1, preferring instead to fall back on their first L2 (Swedish), the Swedish speakers did transfer elements from their L1 but avoided doing so from their first L2 (Finnish)’ (cited in Ellis, R. 2008.The Study of Second Language Acquisition , p. 390). The brain, in other words, is not a machine! Thanks for the feedback. I should emphasize that, obviously, the above-stated points are simply my opinions and preferences based on my experiences as a LL and LT. I understand we all bring different things into the classrooms as teachers and have different students and job requirements, etc. I’ve just never had a positive experience with translation in the classroom as a teacher or learner. On a related note, in my classes this week, I had my students write short dialogs in groups on the board (just 6 lines). Every few minutes, I had the teams switch dialogs and continue working on a new dialog. Then, they sat down and worked in pairs to copy, practice and present one of the dialogs. The “problem” was that when they were writing the dialogs, the STT was basically Korean Talking Time while they were writing in English. I suppose this is normal. Anyway, even though the students loved the activity (which many of them wrote on the papers), I felt that I was doing something wrong. Either I didn’t orchestrate the activity well enough for them to speak in English or my expectations for them to talk in English while writing was misguided. The language level of their writing wasn’t too difficult for them. I just gave them a topic and let them write what they wanted. But they didn’t even try to talk in English. My ESL experience in the US involved students from dozens of different countries, so I could easily organize teams to “force” them to speak English. Now, almost all of my students are Korean, so it’s a different situation. And, yes, I agree. The issue of Ln interference is not really a “ladder.” My experience has been quite mixed interference.